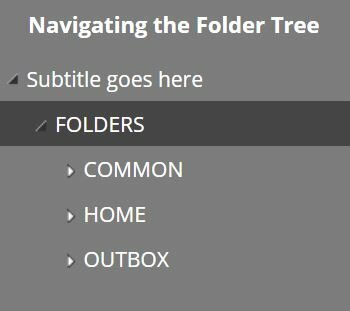 To access and navigate your files and folders in Thru, use the folder tree to the left of the screen to browse your folder hierarchy and use the dashboard on the right to view the contents of folders. The folder tree in Thru web portal is positioned to the left of the screen. The folder tree displays all folders in a user’s file system. Above the tree is the name of the Thru site where the user is currently logged in. 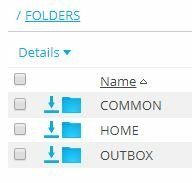 The three folders located in the root of the file system are Common, Home, and Outbox. Common – The folder where you upload files you wish to share with others. These folders may be shared across all users in the company, or certain folders can be restricted to groups or individuals, depending on administrator settings. The name “Common” can also be changed by the site administrator. Home – The folder that contains your personal data files. These files are visible to the individual and their managers and administrators, but the user can share these files by modifying the access rules under the access tab for any folder. When an account is created, the administrator chooses whether or not a user will have a Home folder. A Home folder is needed if the user wants to securely receive files via a personal Thru Dropbox. The My Dropbox subfolders are automatically created for users when a Home Folder is provisioned. Click on the arrows to the left of each folder. This will expand all sub-folders within that folder. 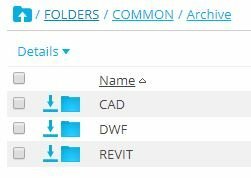 To view the contents stored within folders, select a folder from the folder tree or click on the Folders section from the top of the screen. All files and folders within the file system will be displayed to the right of the folder tree in the user dashboard. 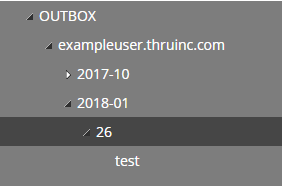 Double-click on folders to open folders and view its contents. 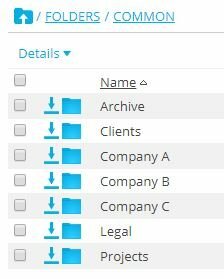 To return to previous folders, use the folder path that is above the file system and click on the name of the folder you want to return to.